Fresh, practical psychology for today’s business - new tools for strategy and problem-solving, innovative leadership ideas, fresh thinking on current issues. Why bother with Formal Concept Analysis (FCA) - is it just another approach to working with repertory grids? Well, FCA presents grid data simply, cleanly and intuitively; its output is remarkably easy to work with. Here’s Carol’s grid presented as an FCA “lattice” [Note 1]. The elements of her grid (possible solutions to her midlife crisis) are in white boxes. The preferred pole of Carol’s constructs in grey boxes. The lines above an element show how it is construed, e.g. “take a psychology course” is construed as “exciting” and “reversible” but nothing else. ● “take a fulltime job” and “have an affair” are construed in exactly the same way; they have the same implications for Carol’s life. ● An element that is construed as “exciting” is also seen as “reversible”, which is somewhat surprising to me! 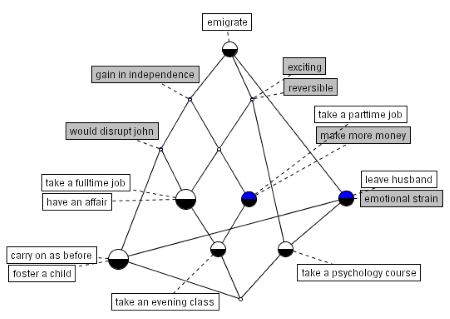 ● “emigrate” has nothing positive about it; there are no constructs above it. Spend a little time studying Carol’s lattice, and you will discover much more. Here is a factor analysis of Carol’s grid. Clearly, there is more complexity and data in the factor analysis picture, than the FCA lattice. But, both factor/cluster analysis and FCA highlight exactly the same findings and questions. ● FCA makes no statistical assumptions; not even one. Whereas factor and cluster analysis make umpteen assumptions, some of which have been pretty questionable for a long time (see Goodge, 1979). ● With a little tinkering FCA accommodates bipolar constructs. ● Although lattices are easy, you probably need to work with a few before you can read them accurately, e.g. a lattice is not a construct hierarchy, the constructs towards the top of a lattice are not more personally important. ● Conventional FCA requires grids to consist of 1s and 0s, not ratings. I converted Carol’s 1 to 5 ratings to 1s and 0s, which lost some detail, but that did not seem to matter. For more on FCA please see my "FCA Page". Please let me know if you'd like to pilot FCA; I'm keen to support its development. There's a quick "Contact me" form on the left. It would be good to hear from you. 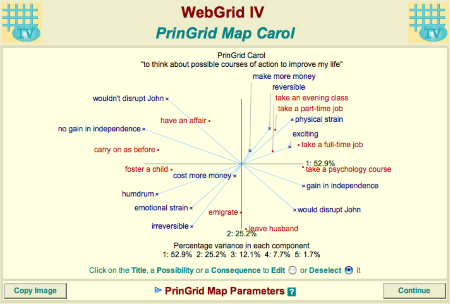 1] I chose Carol’s grid because it is used to demonstrate factor and cluster analysis software – see Carol's Life Crisis. Thank you to Mildred Shaw and Brian Gaines for that. 2] A "formal concept" has precise mathematical definition; it's not the usual idea of a concept. The pole of a construct, e.g. "exciting", is a concept, but not a "formal concept". But, that might be a somewhat pedantic point! Goodge, P. 1979, "Problems of repertory grid analysis and a cluster analysis solution", British Journal of Psychiatry, Vol 134, pp 516 - 521. Copyright Peter Goodge, 2018 . Theme images by enot-poloskun. Powered by Blogger.